We got our appliance rebate reservation yesterday! The Web site crashed, the phones were clogged and the service was amazingly lousy, but persistence paid off. If we buy a new refrigerator within the next 30 days (and recycle our old one), good old Uncle Sam will give us $200 for our trouble. Nice! Which brings me to the real point of this post: EXTERNAL MOTIVATION! We need that in this house. Big time. I mean, really. You'd think we'd have had plenty of internal motivation to replace our refrigerator over the past two years. It has that "I used to be white, but no amount of scrubbing will ever again make me sparkle" thing going on. Lovely. And then there's the duct tape. You see, the shelves fell apart the week after we moved in. Did we buy a new refrigerator? Nah. My MacGyver hubby simply fashioned a solution out of duct tape. I was thrilled, of course. Oh, and I can't forget the freezer. 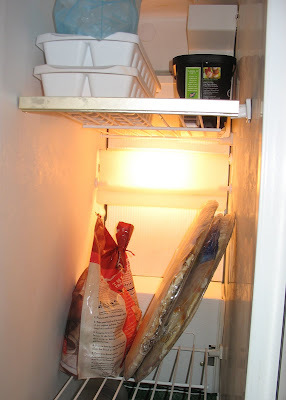 We're now experts at balancing frozen pizzas "just so" in order to prevent them from slipping through the wire shelving. It's an important life skill, people! But soon, all of this will be a distant memory. For we now have a little external motivation — and a deadline. I'm jealous you got your rebate. We bought a new dishwasher 2 weeks ago, before we knew about the rebate. Bummer! That extra $150 would have been nice! 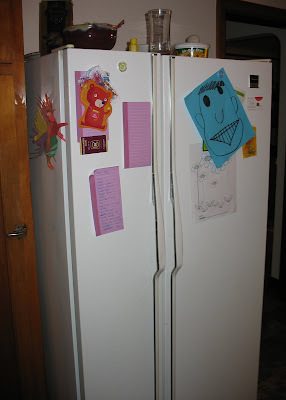 I hope to see photos of your snazzy new fridge on your blog! Yeah! Glad to hear you finally got through. And I didn't even notice the duct tape the other day! 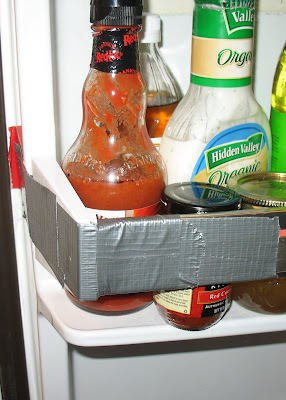 I have the same duct tape situation in my fridge.